Split pea soup, a staple in my home. Easy, simple and good. 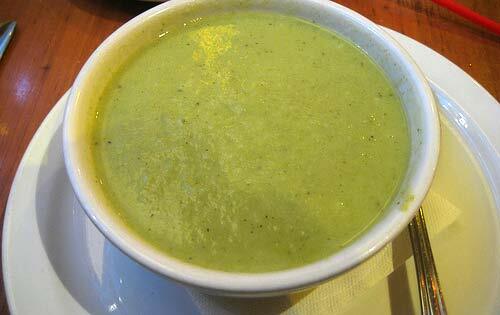 This pea soup recipe qualifies for a "low calorie food" and is one of my best low fat recipes. People either love or hate this soup. A hearty, filling soup, but its visual appeal can diminish if allowed to sit too long. Best to serve as soon as it's ready. My pea soup has less fat than most recipes and is a thick hearty soup. I blend (in my blender) the soup before serving so it is velvety smooth. Not a pea in sight. Of course you can skip this step if you want. Low fat recipes usually are bland and boring. Same with many low calorie foods. Not so with this recipe. Bold, thick, hearty and flavor for days. A perfect match for a BLT or ham and swiss on rye sandwich. For a lighter meal, serve with crusty french bread or cornbread and cole slaw. Pea soup freezes very well so make a big batch, freeze some for future meals when you're pinched for time. SPLIT PEA SOUP RECIPE TIP: Adding a small amount of lemon juice to most recipes enhances the flavor and seasonings of the dish. To see for yourself, make the recipe as is, without lemon juice. Put a small amount in a cup and set aside. Add lemon juice to the soup and compare the flavor to the reserved soup without lemon juice. Amazing isn't it? VARIATIONS: Use yellow split peas in place of green split peas. Or use great northern, navy or lima beans and don't blend soup, leave beans intact. Chop vegetables into bite size pieces rather than the coarse chop. Shred ham slice before serving. CALORIES: 195 calories for generous one cup serving. Don't use smoked ham. A plain ham bone compliments this soup better. Rinse peas. In four quart sauce pan combine peas, water, broth and ham. Cover and simmer for 30 minutes or more. Skim off and discard the foam that collects on top. Add remaining ingredients except salt and pepper and cook until vegetables are tender and peas are soft, about 30 minutes or longer. Remove vegetables and ham pieces, blend soup in a blender. Reheat and adjust flavor with salt and pepper. Garnish with coarse ground pepper, chopped parsley, chopped bacon or shredded ham.